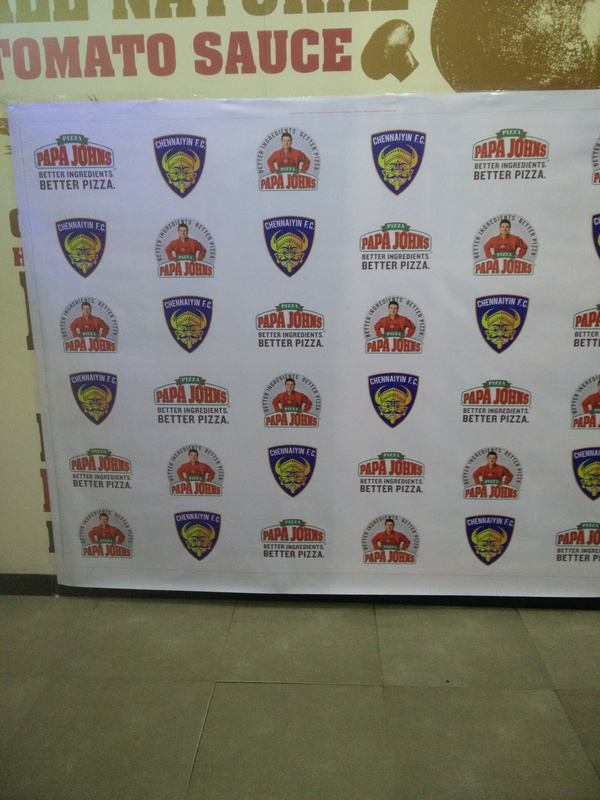 Papa John’s Pizza was closed for public and we were made comfortable by the organizers. Hospitality was at its best and kudos to the organizers. We were well in time and the team arrived around 6.10 pm without making us wait. 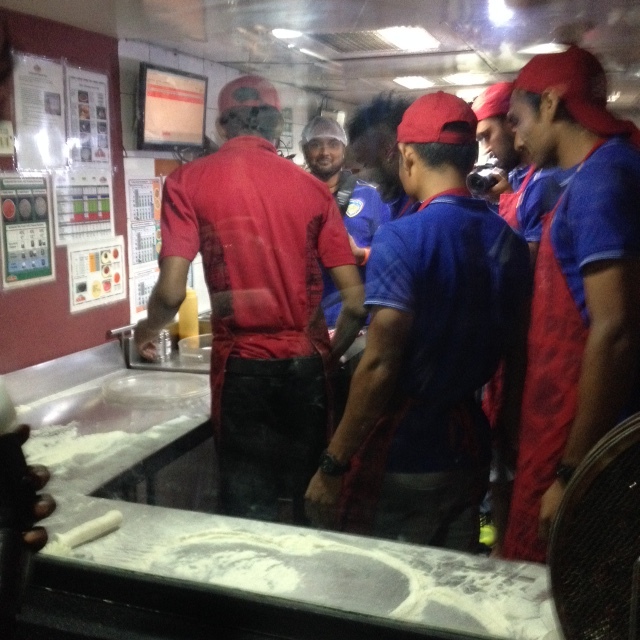 The team members got onto the job within few minutes and the players donned the chef’s apron and hat. 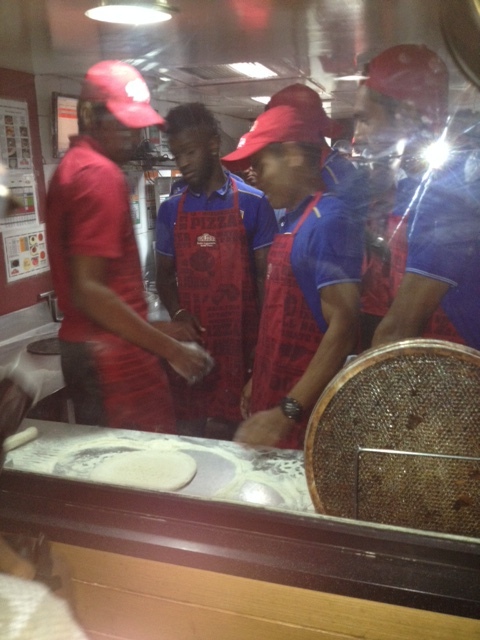 Papa John’s Pizza chef demonstrated pizza making to the players and every player tried their hands into kneading the dough and getting the pizza ready. No bites or interviews by the team. 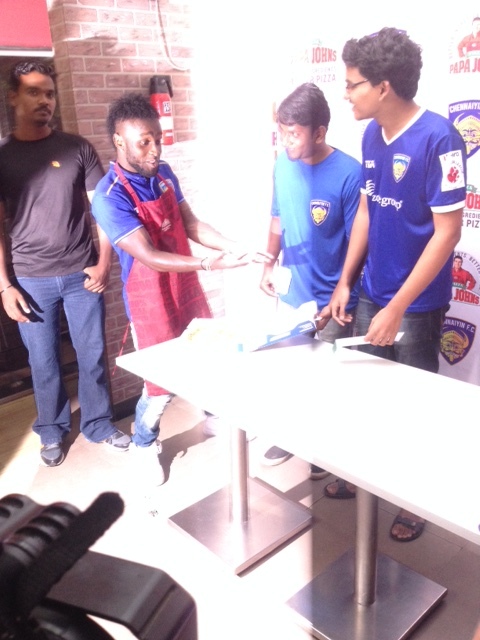 We presume it must be because Indian Super League 2015 is currently under way. 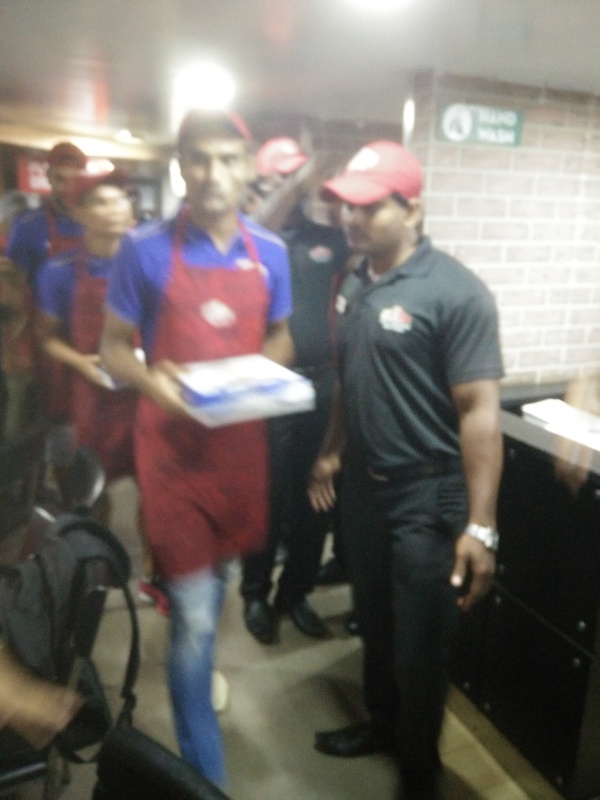 It was media everywhere and in the outlet, it was vying to get closer and Papa John’s had the responsibility of keeping the kitchen clean and hygienic and so restrained people from entering the kitchen en mass. We understood their concern and watched the proceeding through the glass window. 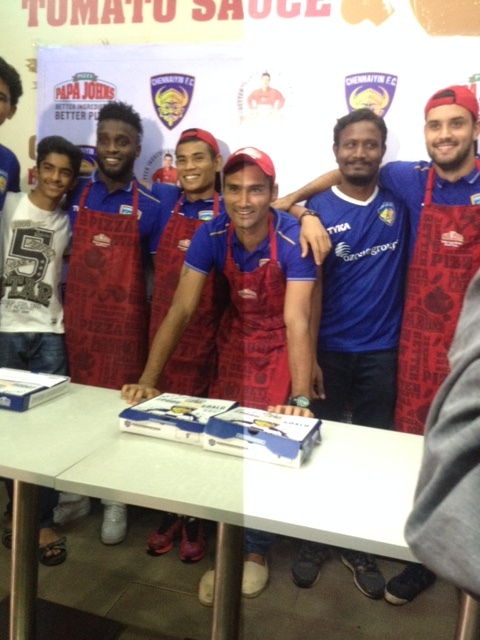 Once the Pizzas were baked, the team presented it to the Chennaiyin FC club fans as they stood in awe for the opportunity to stand next to the favorite stars. 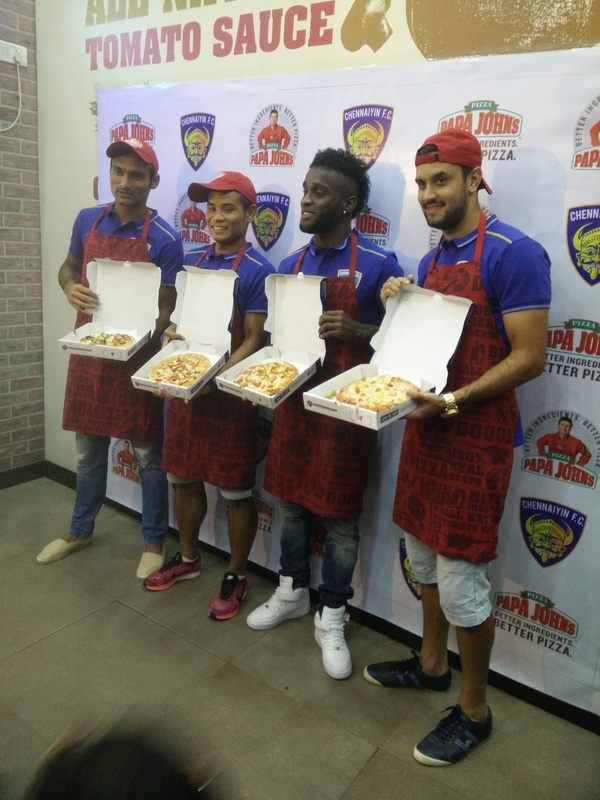 Papa John’s Pizza is Chennaiyin FC official Pizza partner. True to its objective of using better ingredients, the Pizza we were served Pizza was soft, fluffy and tasty carrying elements of finesse in it. The sauce has no preservatives and obviously it tasted fresh. India is home to varied sports and we are happy that football is getting patronage from leading business tycoons and celebrities. 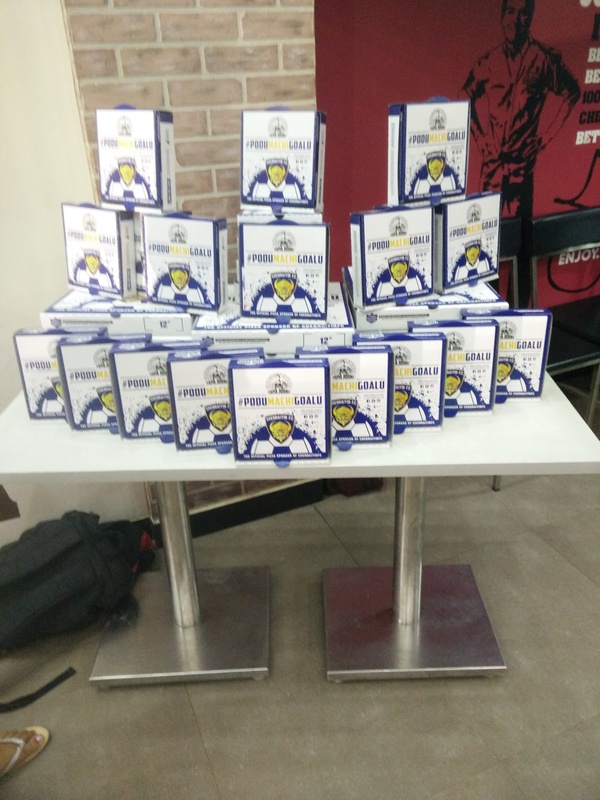 We are happy to see media presence to cover this event of Chennaiyin FC and wish more media coverage and appreciation develops for this sport. Indian Super League (ISL) 2015 is currently On. 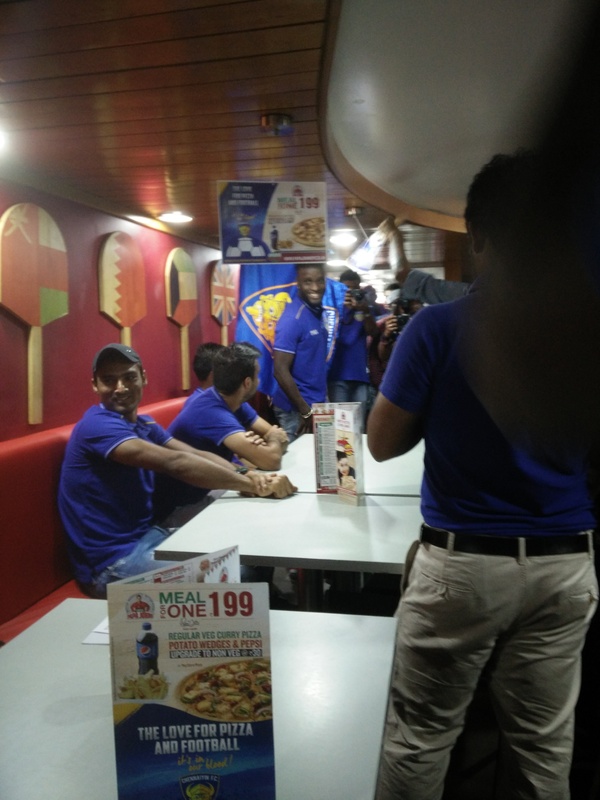 Chennaiyin FC is owned by Vita Dani, Abishek Bachchan and Mahendra Singh Dhoni. The player manager of the team is Italian World Cup Winning Defender Marco Materazzi and it marquee player is former International midfielder Elano Blumer. 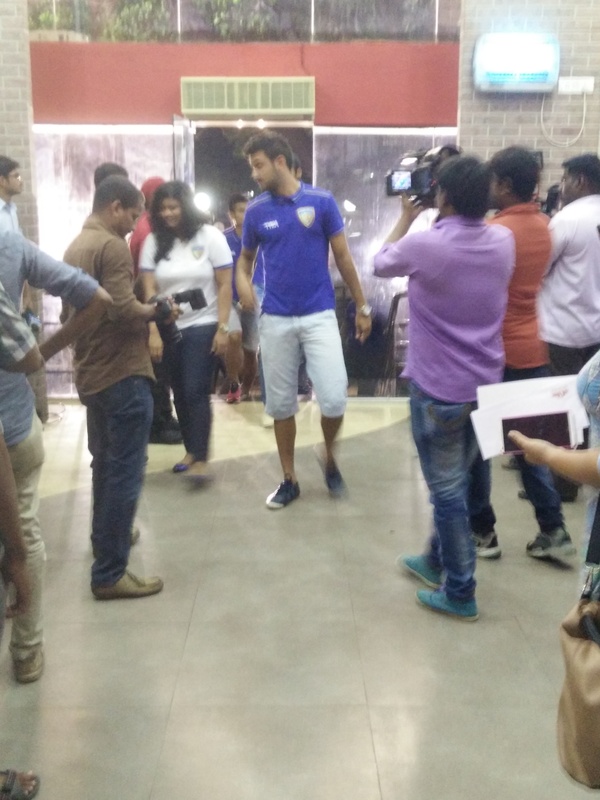 We wish our Chennaiyin FC team all the best and success in all its endeavors and a thumping victory in the ISL 2015. 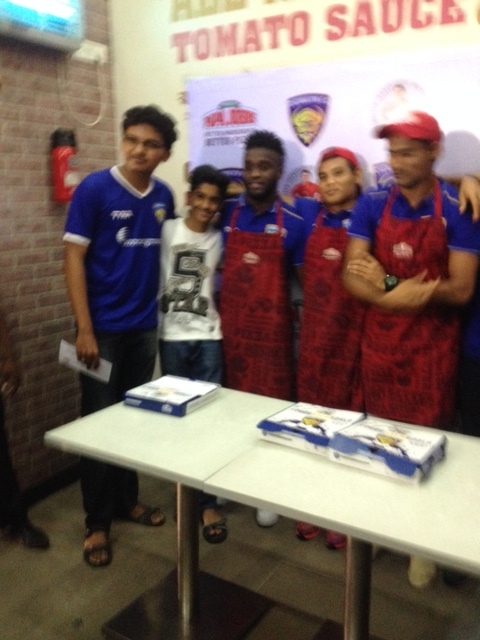 Posted on November 2, 2015, in Events, Sports and tagged abishek bachchan, bruno, Bruno Pellisari, chennai event, chennaiyin FC, dhoni, events, ISL 2015, karanjit, Mendy, papa john, pizza, Stiven Mendoza, Thoi, vita dani. Bookmark the permalink. Leave a comment.